When I first came to Trinity, I remember craving anything but Mather food. Luckily my Nest’s Trinisition Fellow, Chanel Erasmus, often ordered fried rice with chicken and vegetables so we didn’t have to survive on Mather food. This dish reminded me of my home in Pakistan because of its colorful presentation and strong flavors. 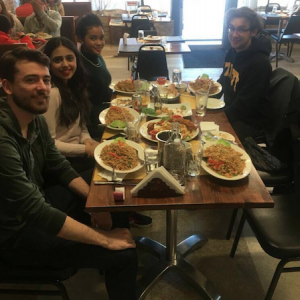 Knowing that food is important to her Nest members, Chanel invited students staying on campus for Trinity Days to Piolin, which is a local Peruvian restaurant. Fortunately, Piolin was a five-minute walk from Trinity’s campus. Piolin is comfortably located on the corner of New Britain Ave. without flashy signs or bright lights; something you’d find in my hometown in Pakistan. It is a plain red building with a sign which reads “Piolin Restaurant, Specialty in Peruvian Food.” The unattractive building threw me off a bit but I fell in love with the restaurant as soon as I went inside. It was sufficiently warm, a necessity on a cold afternoon. Tables were huddled up against the walls and two long tables rested in the middle of the restaurant. Behind a counter on the far-side of the wall stood eager waiters and waitresses holding colorful menus. A baseball game played on the awkwardly placed television that no one was watching. We sat on our comfortable chairs and started browsing through the menu. There were pictures of several delicious dishes on the menu. Unfortunately for me, the menu was mostly in Spanish and the dishes had Spanish titles. I browsed through to find fried rice but after a few minutes gave up on my search. A lot of my friends knew Spanish so they didn’t face any such problems. Soon the waitress came to take our respective orders. “Arroz Frito Con Pollo,” answered my friend to my unasked question. I unsuccessfully tried to pronounce the words but thankfully the waitress understood what I meant. The wait was shorter than I had expected it to be. We were given our extremely generous servings of food within 15 minutes. Almost all of us had ordered fried rice and chicken and none of us regretted it. It was simply mouthwatering. However, the highlight was the famous complimentary green sauce that Piolin serves with fried rice. Fortunately, you can order as much green sauce as you want. It has the perfect blend of sweet and salty and it’s also creamy so it tastes delicious with the rice. No matter how badly we wanted to, we couldn’t even finish half of our plates. With our satisfied stomachs and take-home boxes of food, we headed back to Trinity.